Amid its strong drive for artificial intelligence, Samsung Electronics is preparing to open new AI research centers, likely in Switzerland and Germany, this year, in addition to seven existing centers across the continents, according to the company’s high-ranking officials on Monday. “Samsung will open additional AI centers this year to attract more AI experts, and the places under consideration include Switzerland and Germany,” a Samsung official told The Korea Herald. The comment was made in response to a question about Samsung’s current progress in efforts to secure top talent in AI. “We are having difficulty in scouting AI talent because not many experts are left at school,” the official said, with the majority of them already taken by competitors like Google and Amazon. If Samsung sets up new centers in the two European countries, it will have nine in total. The Korean company opened an AI lab in Paris last year, but it is a smaller lab organization compared to other centers. Samsung heir Lee Jae-yong visited several cities in Germany, including Stuttgart and Munich, and Geneva of Switzerland, during a business trip last year. Samsung has announced its plan to have at least 1,000 experts from different fields of AI by 2020, and started establishing research centers in different countries. 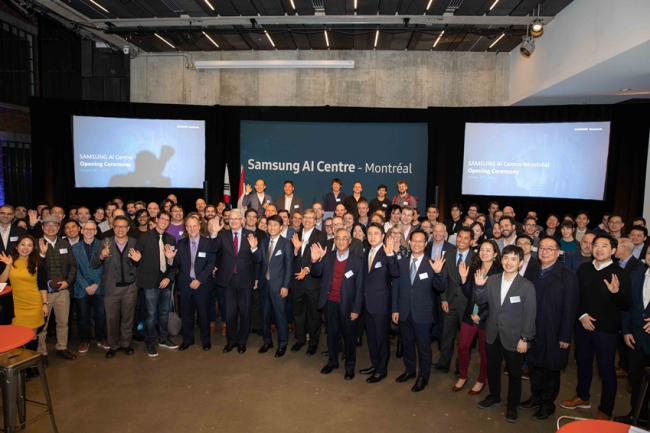 Last year alone, Samsung opened six AI centers in Silicon Valley, Cambridge, Toronto, Moscow, New York and Montreal, hiring the regions’ top talent. The head office for AI research is based in Seoul, and each center has its own specialized field. The Silicon Valley center focuses on AI interaction, while the Cambridge center concentrates on data intelligence and AI-based emotion recognition. Those in Moscow and Montreal specialize in machine learning. Toronto researches visual understanding, and New York centers on robotics. Each center reportedly aims to have at least 100 experts, while some bigger centers could hire more than that number, to reach the company’s goal of having 1,000 talented individuals in total. However, it has not been easy for the Korean tech giant to reach the goal. Another Samsung official gave a similar outlook, expressing difficulties in finding and hiring the right pool of talent in a limited span of time, amid heavy recruitment competition among rivals. Samsung could also consider Poland as a home for AI, aoccording to the executive. Currently, researchers at Samsung's research institute in Poland are contributing to improving AI platform Bixby, although it is not an AI-focued organization. While refusing to confirm any venues being considered for its latest AI centers, Samsung's communications officials said, "Samsung is opened to considering any place in the world to set up AI centers should it accompany good talents."